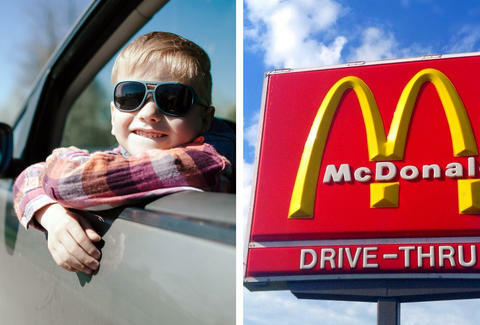 An 8-year-old Ohio boy allegedly stole a car and drove to McDonald's with his 4-year-old sister in tow Sunday night. He had taught himself how to drive after watching YouTube videos. He had reportedly been craving a cheeseburger and ordered one at the drive-thru. According to the Weirton Daily Times, McDonald's workers who saw him pull up at the drive-thru window thought they were being pranked. The boy apparently intended to pay with money culled from his piggy bank savings. All the while, his parents were at home, asleep early after a full day outside playing with the children, police said. "The workers thought that the parents were in the back, but obviously they weren’t," Jacob Koehler, a police officer in East Palestine, Ohio, told the Weirton Daily Times. Koehler said he was impressed with the 8-year-old's driving. The McDonald's was a mile and a half away from the family's home and according to eyewitness reports, the child obeyed all traffic laws, stopped at red lights, and waited for traffic to pass by him before taking a left turn into the McDonald's lot. He didn't receive a single call reporting property damage or accidents involving the child behind the wheel. The boy had learned how to drive after watching YouTube tutorials. It's not that surprising that an 8-year-old with some savvy could pick up those skills, given that YouTube offers free tutorials on just about everything. The boy grabbed the keys to his dad's locked van while the parents were asleep and he and his sister were on their way. Upon learning that he had done something wrong by taking his parents' van and doing this, the child started crying and told police that he just wanted a cheeseburger. Fortunately, this doesn't look like a case of neglect, the cops said -- both children had been fed three square meals that day -- but a McDonald's cheeseburger craving is a powerful thing. In the end, the boy and his sister were fed cheeseburgers, chicken nuggets, and fries while waiting for their grandparents to pick them up. No charges were filed. Eric Vilas-Boas failed his road test twice. Follow him on Twitter @e_vb_.